Going on vacation to Thailand? Eager to see the famous Thai elephants close up? Our guide to elephant camps in Thailand give you the facts & information you want. 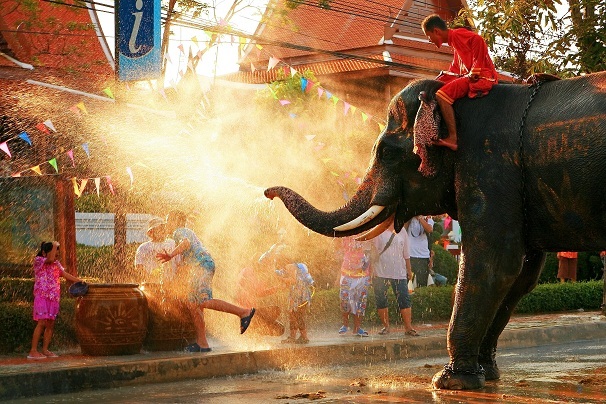 The elephant is the national animal of Thailand and features prominently in its history, traditions and folklore. For centuries rural Thai villagers would use elephants to help in the harvest of crops while the Thai military relied on elephants in their series of wars against neighbouring Burma. The elephant in Thailand has traditionally been a respected and even venerated animal which is why it is sad to some elephants being exploited for financial gain at tourist centers. Often, unscrupulous people will rent an elephant and take it wandering down busy tourist shopping areas and food courts offering tourists the chance to have their photo taken with the animal or to feed it some sugar cane for a highly inflated price. Such opportunists are to be avoided as patronizing them will only perpetuate the exploitation of elephants in Thailand. The best place to come into close contact with elephants is in one of the many established elephant camps in Thailand. These camps provide sanctuary to many elephants that were previously exploited in the cities and the level of care is really quite good. Animals at the camps are well feed and given fresh bedding, all of which costs money. In order to help fund these camps offer tourists the chance to come have a look around the elephant camps and even ride the elephants. Riding an elephant at one the elephant camps is easy. The elephant is mounted with a saddle that is more like a comfortable chair for two people. The elephant crouches down and a platform is placed at its side while you mount the elephant. Once you’re on, the tour guides will the lead the elephant on a trek through the jungle that typically lasts an hour. On the way you get you get to have your picture taken by one of the staff at the elephant camp. These are a little pricey but most people don’t mind paying. A cheaper alternative would be to give your tour guide your own camera and have him snap away. It would definitely e appreciated if you gave him a tip but this would be a fraction of what you’d pay otherwise.